Students have the opportunity to win awards for projects focusing on local history. Students can make a contribution to local history scholarship and awareness by researching and sharing untold stories of local history. They can also gain a greater sense of civic engagement, recognizing the role that “everyday people” have played in their own community’s history. Researching local history also contributes to student understanding of the new Mississippi Department of Education (MDE) history framework. To help Mississippi students prepare local history projects for National History Day, here are local history awards, topic ideas, sample entries, and resources. 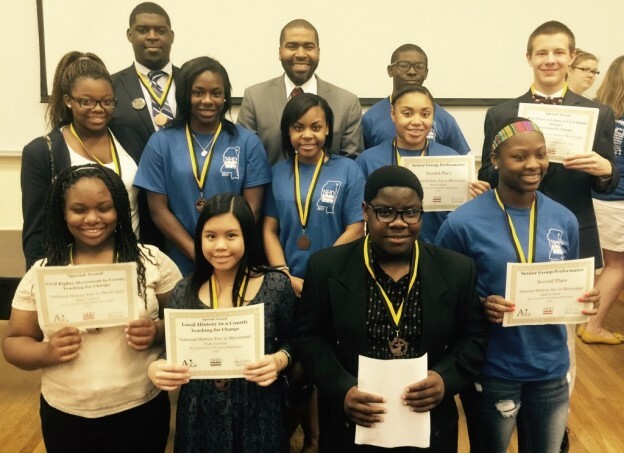 Learn more about the National History Day competition in Mississippi. a seldom told story in labor or civil rights history from anywhere in the state of Mississippi. The entries can be based on oral histories, archival research, or other forms of researching and sharing local history. The awards will be for the student and the student’s teacher. The goal is to deepen student appreciation of and exploration of the untold stories and role of “everyday people” in local Mississippi history, using the National History Day competition as an incentive and a focus for student projects. The selection for these awards will be made on the same day as the state competition in Hattiesburg. Thanks to the W.K. Kellogg Foundation, winners will receive $100. Here are our 2015 winners. We will make every effort to ensure that all the history projects (even those that are not award winners, as long as they meet certain standards) are shared in ways where they can add to the historical scholarship and public awareness of Mississippi’s local history. We have developed a list of sample topics on labor and civil rights stories in Mississippi history that either need more research for the historical record or have not received sufficient national attention. These are only suggestions, there are many more stories in Mississippi history that would be ideal for National History Day projects. Here are some examples of National History Day projects based on a local story with national implications and/or a little known story about Civil Rights Movement or labor history. Film created by high school students in McComb, Miss. based on this historic student walkout, based on student collected oral history interviews. Watch film. Website about longtime Louisville, Kentucky civil rights movement activist Anne Braden, produced by two students based on resources from the University of Louisville’s Ekstrom Library. Visit website. Milwaukee Open Housing Campaign: A Revolution for Equal Opportunity. Website about the struggle for fair housing in Milwaukee, Wisc., produced by a student based on reading books and use of the local archives. Website no longer online. Oral history collection guides and resources for the classroom. Archives, books, and organizations on the Civil Rights Movement and labor history in Mississippi.